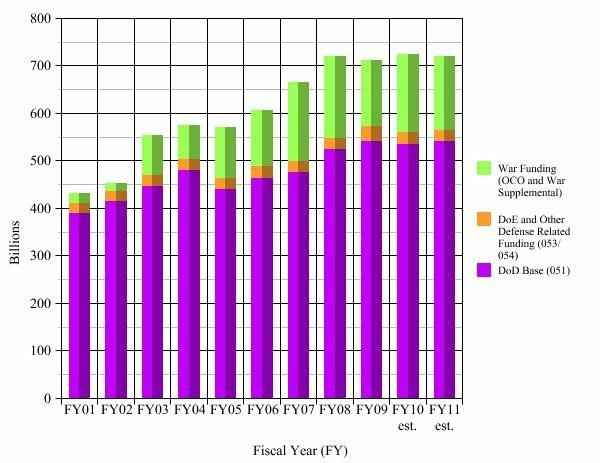 Whether or not one recklessly and misleadingly includes Social Security and Medicare and Medicaid in discussions of the federal discretionary budget, the fact remains that over half of the discretionary budget (of everything other than Social Security and Medicare and Medicaid) is military. 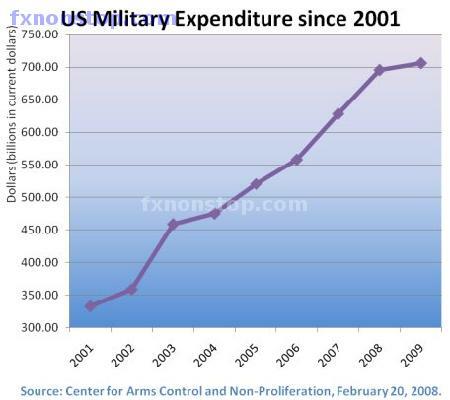 The primary talking point coming out of the White House is the need to freeze all non-military discretionary spending. And yet it is difficult to find a progressive analysis of the budget President Obama proposed on Monday [2/14/11] that even mentions the existence of the military. Here’s Robert Reich arguing for taxing and spending. I agree with everything he says. I would tax the rich if all it accomplished was taxing the rich. I would spend on the poor if the money had to be borrowed. But there has to be some reason why Reich does not mention the option of funding everything he dreams of and more by cutting the military back to merely three times the size of anyone else’s. He must believe the United States benefits from and can survive an ever-larger military budget. Or he must be afraid to say otherwise. 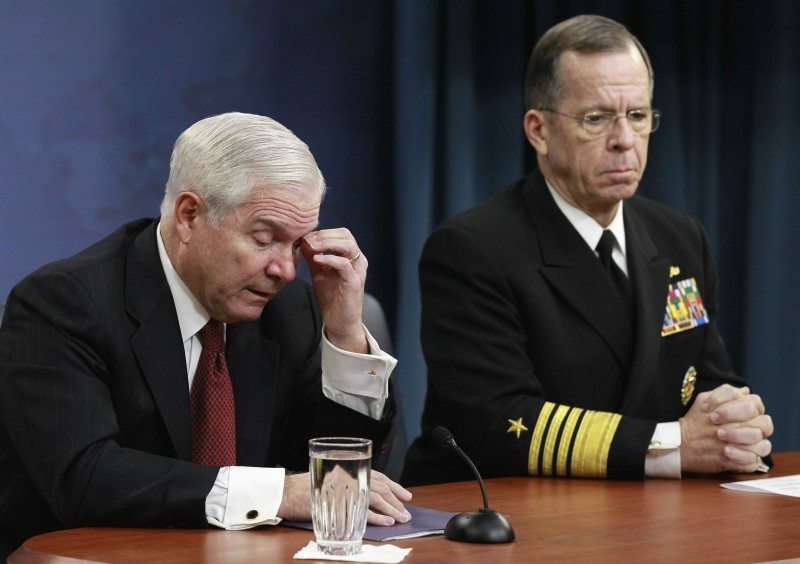 Defense Secretary Gates and Admiral McMullen contemplating cuts to the Pentagon's budget. You can find similar, military-free analysis at the Campaign for America’s Future , although CAF does squeeze mention of the military in here, and at the Nation. At Huffington Post the main story doesn’t mention the military, and it’s followed by a blurb misleadingly suggesting that the “defense” budget is being cut, while in reality it is going up. The Center on Budget and Policy Priorities includes one half sentence misleadingly suggesting “defense” is being cut. Ezra Klein, not your most progressive blogger, was, to his credit, among those bucking the trend. He called the United States government an insurance conglomerate protected by a large, standing army and pointed out that the Defense Department won the future, or at least the budget. You can listen to the audio recording of a phone call the White House held on Monday with progressive bloggers here. Congressional Budget Office spokesman Ken Baer briefly mentions the White House’s misleading claim to be cutting $78 billion from “defense” without stressing that those are theoretical cuts in future years and cuts from a dream list but actually increases above this year’s budget. White House adviser David Plouffe did not mention the military at all in his initial comments when he joined the call late. Progressive bloggers asked why the budget was so hard on poor people and so easy on the rich, why funding for poor people’s heat was being slashed, how cuts could possibly be good for the economy, et cetera. They wanted spending, not cuts. They dragged in Social Security. But the call was almost over before a single one of them brought up the existence of the U.S. military, despite the fact that over half of discretionary spending goes there, and despite the consensus among economists that the same spending elsewhere would produce many more jobs and jobs with better pay. Christina O’Connell with FireDogLake, always the best blog that manages to maintain access to these calls, asked about the pretended cuts in military spending and about the ongoing war spending and whether there would be additional off-the-books supplemental bills. Plouffe replied by bashing Bush’s practice of using supplementals despite Obama having broken a promise and used them for the past two years, but did not promise not to go on using them for a third year. At the same time Plouffe meaninglessly bragged about a decrease in war spending in the 2012 budget. He did not reply at all to the first half of O’Connell’s question, regarding the pretense that overall military spending is being cut while in reality it is going up. He did not explain that the theoretical future cuts are only proposed as cuts to wish lists while still allowing the budget to increase year by year. Why the lack of interest among the other bloggers in the majority of the budget they are reporting on? Do progressive bloggers consider it their duty to talk (albeit in a better way) about the topics those in power want to talk about? Would it be rude to raise a new topic no matter how relevant? Or do progressives who are loyal to the Democratic Party and therefore invited on White House phone calls share Barack Obama’s desire to increase the military every year and use it against a growing number of countries each year? These are serious questions, even deadly serious questions. A report says that Washington spends $300 million of American taxpayers’ money on the Afghan war per day, and this comes as the US has failed so far to establish security in the war-torn country. Under the Pentagon’s proposed budget, the cost of the wars in Iraq and Afghanistan will drop to $117.8 billion for fiscal year 2012, a reduction of $41.5 billion from the previous year, AFP reported. The military has become an entitlement program for politicians and the private contractors they serve. House Speaker Boehner is not about to cut $450 million for the construction of a Joint Strike Fighter engine the Pentagon doesn’t even want. Much of that money would go to GE and Rolls Royce in his Ohio home state. But this relationship between pol and business is no surprise. It is pathetic however that the major media has spent days critiquing Anderson Cooper’s coverage of Egypt- Not journalism! Yes it is! ad nauseum, but either chooses to ignore or can’t see that the Empire has no clothes. Nobody is closer to GE and CEO, Jeff Immelt, than President Obama. Until we start blaming both parties, the war spending will not stop. One thing we have learned over the last two years is that far left hates the rich much more than they hated the wars. The wars and war spending has gone on for another two years without a challenge in the press or the streets while left is still upset about the tax compromise that did not decrease any tax rates. It is pretty clear the war stopped being an issue once the president changed. RB – Not sure who you mean by the “far left”. Who is the “far left”? The rich caused the wars – so what’s the problem with focusing on the root cause? It is true that with the election of Obama – the anti-war candidate – protests about the wars have subsided to a large extent – until recently. Did you see the arrests of the vets and others at the gates of the White House last December? The so-called tax compromise was something that all kinds of folks were pissed off about, as it had been one of Obama’s campaign pledges. And you are wrong on that score, as it did allow the continuation of the Bush tax cuts which were set to be raised. So the tax compromise did decrease tax rates for the well-off, the wealthy, and the super-wealthy, and at the same time raising tax rates for the lower third of the tax-payers – people like me. A good place to identify who is on the far left is to identify those who opposed keeping taxes at their current levels. Both the far right and far left can also be found by looking at those in congress who would not compromise on several issue in December. As for broken campaign promises, I would say….GITMO. It was good to see the Vets at the gates of the White House….good job by our Vets once again. Saying the rich caused the wars is no different than the other side saying the Muslims caused the war. It just shows one side hates Muslims and the other side hates the rich. Sorry, RB dude, you’re comparing apples and bananas. Your last statement of “It just shows one side hates Muslims and the other side hates the rich” is nonsensical, ahistorical, and from way out in right field. Good to see the Rag take on the Military entitlements issue. Older Article: Was a ‘weapon of mass effect’ found in San Diego?